I have become a huge fan of Korres beauty products! 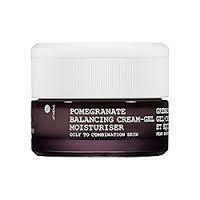 I most recently got the chance to review Korres Pomegranate Balancing Cream-Gel Moisturiser. Clinically proven in only 4 weeks to minimize the look of pores, help reduce the appearance of redness and improve skin radiance. 15% Pomegranate water and Pomegranate Extract: A powerful anti-oxidant, rich in Vitamins A, C & E, tannins and polyphenols, helps to minimize the appearance of pores and rejuvenate the skin. Alpine Willowherb extract: Refines the appearance of pores, and provides a matte finish. Salicylic acid: Acts as skin conditioner. My thoughts: I had just about given up on using a daily moisturizer because of how greasy and oily most moisturizers made my skin. The problem was that I needed a moisturizer! My skin was getting so dry in the day time. (Oily, yet dry, go figure.) When I read that Korres Pomegranate Balancing Cream-Gel Moisturiser was supposed to have a matte effect on my skin, I decided to give it a try. I was so surprised at the results! I applied it after washing my face in the morning and was amazed at how well it absorbed. My skin felt soft and hydrated. After that I applied my foundation and I went throughout the day without grease or shine, yet my skin was supple and very nicely moisturized. I love it!